Lynn Fontanne (/fɒnˈtæn/; 6 December 1887 – 30 July 1983) was a British-born American-based actress for over 40 years. She teamed with her husband, Alfred Lunt. Lunt and Fontanne were given special Tony Awards in 1970. They both won Emmy Awards in 1965, and Broadway's Lunt-Fontanne Theatre was named for them. Fontanne is regarded as one of the American theater's great leading ladies of the 20th century. 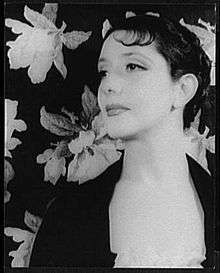 Born Lillie Louise Fontanne in Woodford, London, of French and Irish descent, her parents were Jules Fontanne and Frances Ellen Thornley. She had two sisters, one of whom later lived in England; the other lived in New Zealand. She soon became celebrated for her skill as an actress in high comedy, excelling in witty roles written for her by Noël Coward, S.N. Behrman, and Robert Sherwood. However, she enjoyed one of the greatest critical successes of her career as Nina Leeds, the desperate heroine of Eugene O'Neill's controversial nine-act drama Strange Interlude. From the late 1920s on, Fontanne acted exclusively in vehicles also starring her husband. Among their greatest theater triumphs were Design for Living (1933), The Taming of the Shrew (1935–36), Idiot's Delight (1936), There Shall Be No Night (1940), and Quadrille (1952). Design for Living, which Coward wrote expressly for himself and the Lunts, was so risqué, with its theme of bisexuality and a ménage à trois, that Coward premiered it in New York, knowing it would not survive the censor in London. The duo remained active onstage until retiring from stage performances in 1958. Fontanne was nominated for a Tony Award for one of her last stage roles, in The Visit (1959). Fontanne made only four films but nevertheless was nominated for the Academy Award for Best Actress in 1931 for The Guardsman, losing to Helen Hayes. She also appeared in the silent films Second Youth (1924) and The Man Who Found Himself (1925). She and husband Alfred also were in Hollywood Canteen (1944) in which they had cameos as themselves. The Lunts starred in four television productions in the 1950s and 1960s with both Lunt and Fontanne winning Emmy Awards in 1965 for The Magnificent Yankee, becoming the first married couple to win the award for playing a married couple. Fontanne narrated the 1960 television production of Peter Pan starring Mary Martin and received a second Emmy nomination for playing Grand Duchess Marie in the Hallmark Hall of Fame telecast of Anastasia in 1967, two of the few productions in which she appeared without her husband. The Lunts also starred in several radio dramas in the 1940s, notably on the Theatre Guild programme. Many of these broadcasts still survive. Twenty years later, on 5 May 1978, Lynn Fontanne, aged ninety, was honored at the Lunt-Fontanne Theater, during a revival performance of Hello, Dolly!, by its star Carol Channing. A reminiscence of that evening, "An Evening with Lynn Fontanne", was published on-line by Martha Rofheart, a former protégée of Fontanne. In 1964, Lunt and Fontanne were presented with the Presidential Medal of Freedom by then-President Lyndon Johnson. 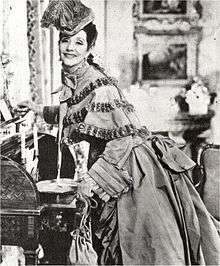 Like Lunt, Fontanne was a member of the American Theatre Hall of Fame. Fontanne was also a Kennedy Center honoree in 1980. Fontanne married Alfred Lunt in 1922. The union was childless. The couple lived for many years at "Ten Chimneys" in Genesee Depot, Wisconsin. They were married for 55 years and were inseparable both on and off the stage. Fontanne went to great lengths to avoid divulging her true age. Her husband reportedly died believing she was five years younger than he (as she had told him). She was, in fact, five years older, but continued to deny, long after Lunt's death, that she was born in 1887. Lunt and Fontanne made multiple performances on the 1940s and '50s radio anthology series Theater Guild on the Air (also known as "United States Steel Hour"). These programmes were hour-long adaptations of famous plays. The couple performed together eight times on the programme, and each appeared three times without the other. Recordings of most of these episodes still exist unless noted. ↑ "Fontanne". Dictionary.com. Retrieved 14 July 2016. ↑ Parker, Dorothy. "Lynn Fontanne." Life. 24 November 1921. p. 3; Silverstein, Stuart Y., ed. (1996) [paperback 2001]. Not Much Fun: The Lost Poems of Dorothy Parker. New York: Scribner. p. 100. ISBN 0-7432-1148-0. ↑ ""Lunt and Fontanne," Encyclopaedia Britannica". ↑ Grange, William (2009). Historical Dictionary of Postwar German Literature. Lanham, MD: Scarecrow Press. p. 62. ISBN 0810867710. 1 2 3 4 "Lynn Fontanne is Dead at 95; A Star with Lunt for 37 Years", The New York Times, 31 July 1983. Retrieved 17 April 2014. ↑ "The Lunt-Fontanne Theater". Playbill.com. Retrieved 28 April 2014. ↑ "Lynn Fontanne 'look' lives on." Milwaukee Sentinel. 10 October 1983. Retrieved 27 October 2014. ↑ Harbin, Billy J. (ed.) (2007). "LUNT, Alfred". The Gay & Lesbian Theatrical Legacy: A Biographical Dictionary of Major Figures in American Stage History in the Pre-Stonewall Era. Ann Arbor: University of Michigan Press. pp. 260–264. ISBN 978-0-472-06858-6. 1 2 Ware, Susan and Stacy Braukman (2005). Notable American Women: A Biographical Dictionary, Volume 5: Completing the Twentieth Century. Cambridge: Belknap Press of Harvard University Press. p. 217. ISBN 978-0674014886. "Lynn Fontanne". Find a Grave. Retrieved 30 October 2014.